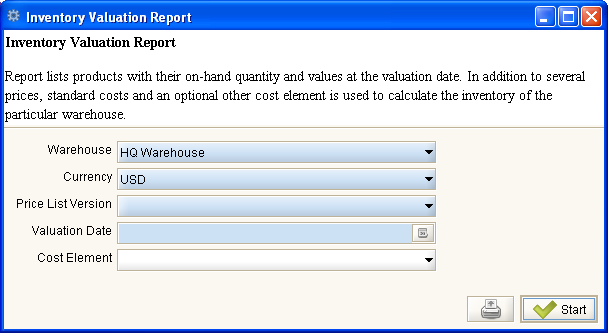 Help : Report lists products with their on-hand quantity and values at the valuation date. In addition to several prices, standard costs and an optional other cost element is used to calculate the inventory of the particular warehouse. The intention of the process is to fill the table T_InventoryValue with different values taken from standard cost, price list values and an additional optional cost element. Insert Standard Costs for all products - the cost standard is put on the column CostStandard. Cost record is selected according to the cost type from the primary accounting schema of client, and the cost element marked as "Material" type and "Standard Costing" method. All records are created for the selected warehouse (and org of warehouse). Qtys and prices are left null initially. Table T_InventoryValue for the AD_PInstance_ID of the process, with the columns filled according to the process described. Client AD_Client_ID Client/Tenant for this installation. This page was last modified on 6 March 2009, at 16:21.